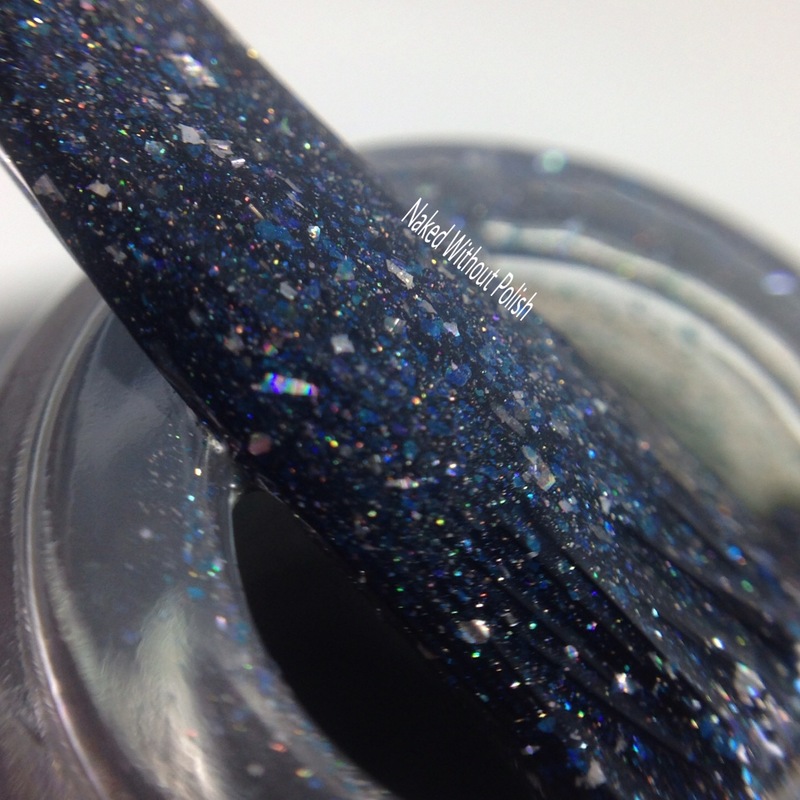 Say Yes to You is described as "a lavender linear holo crelly that features a soft blue shimmer, and tiny silver glitter". Shown is two coats of Say Yes to You with top coat. Say Yes to You is the perfect message and polish for June. June is the month of graduations and weddings, don't lose sight of your goals and your needs. A beautiful formula, with a smooth application. I only did two coats, a third probably could have been done, but I loved how it looked. 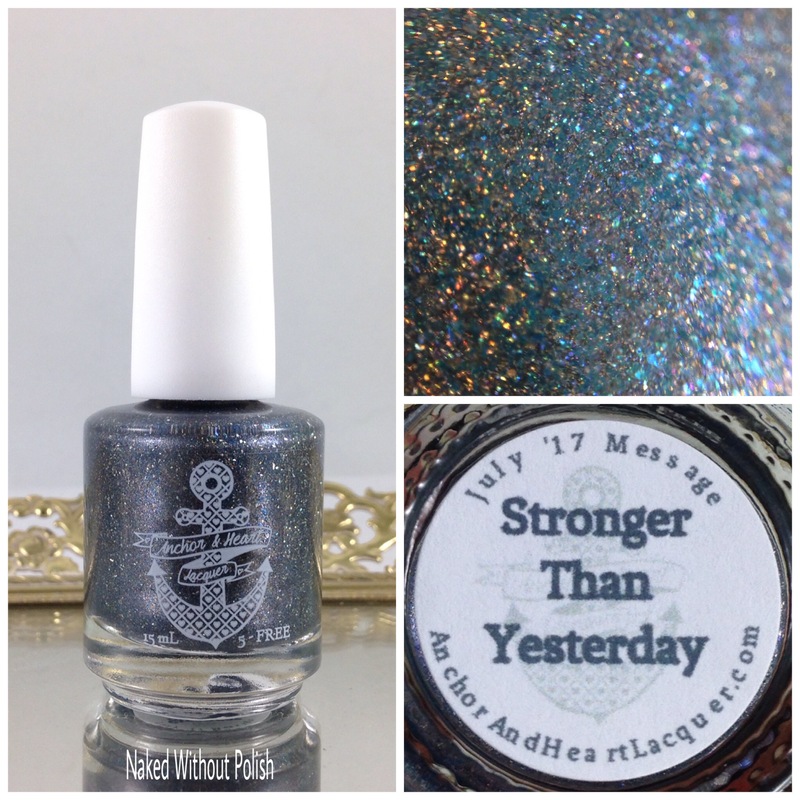 Stronger Than Yesterday is described as "a very dark grey linear holo polish with strong blue shimmer, and a scattering of holo micro flakes". Shown is two coats of Stronger Than Yesterday with top coat. Stronger Than Yesterday may not be that power house red that seems to make us feel empowered and strong, but this grey will go with anything. It's a little bottle of versatility. It is packed with glittery goodness so it is slightly thicker than normal, but by no means is it difficult to work with. It was pretty much a one coater, but a second coat gives it a bit of dimension and a wonderful sparkle. 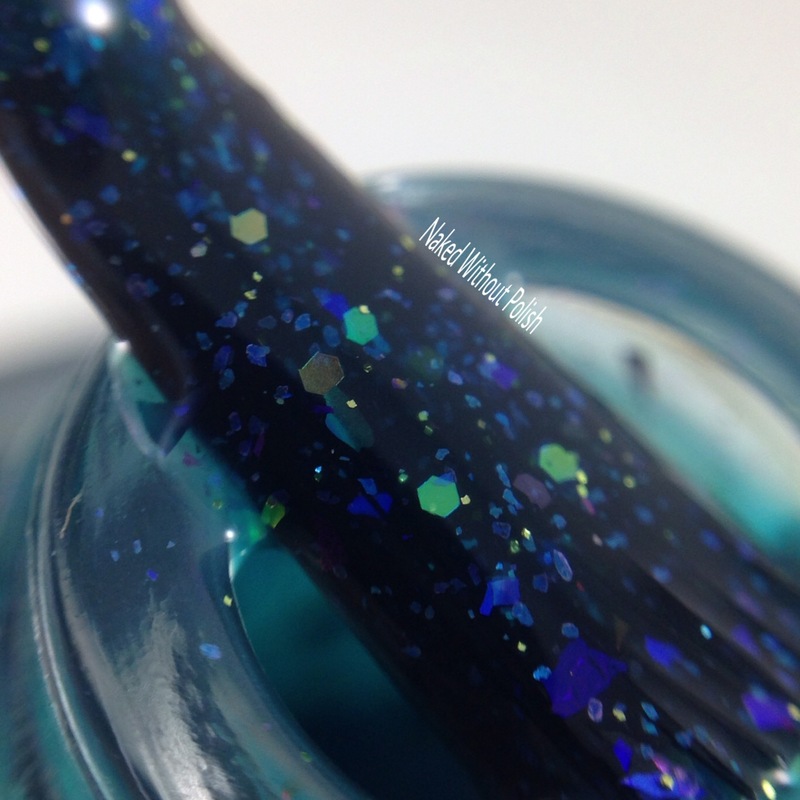 Sparkle On, Darling is described as "a murky teal/blue jelly that features various iridescent glitters, micro flakies, and UCC flakies". Shown is three coats of Sparkle On, Darling with top coat. 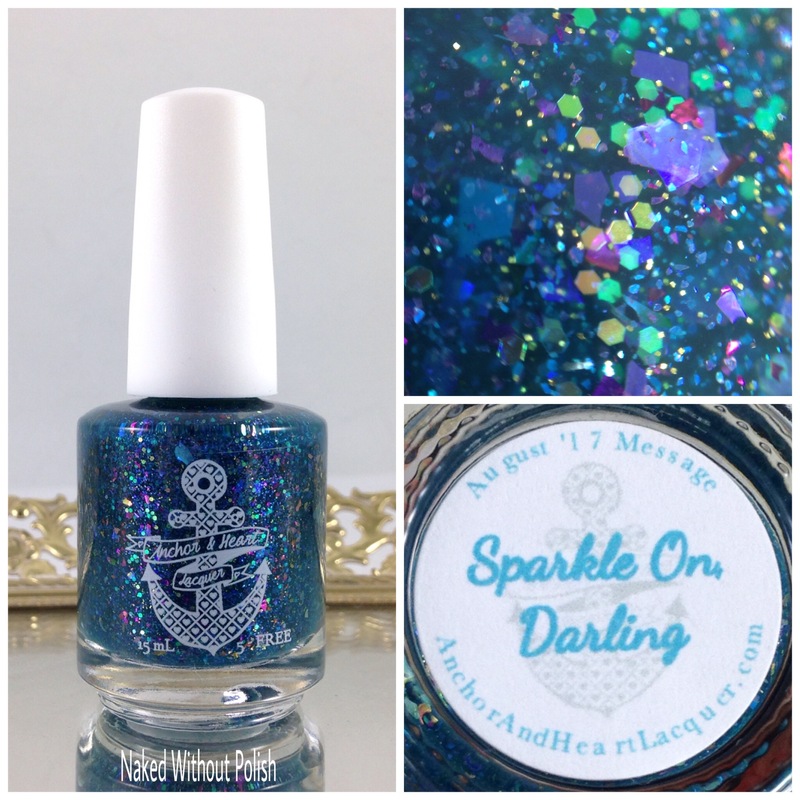 Sparkle On, Darling is the sassy bff that's always encouraging you when times get tough. Three perfect coats is what you'll want with this one. Not only for the full coverage, but for the beautiful layering of the flakes and glitter. All three of these Message in a Bottle polishes, as well as the past months, are available now at www.etsy.com/shop/AnchorHeartLacquer. Each of these three are $11 each, but as a group they range from $10 - $11. If you haven't snagged any yet, go take a look. They are great as gifts too! A little mood booster in a bottle. 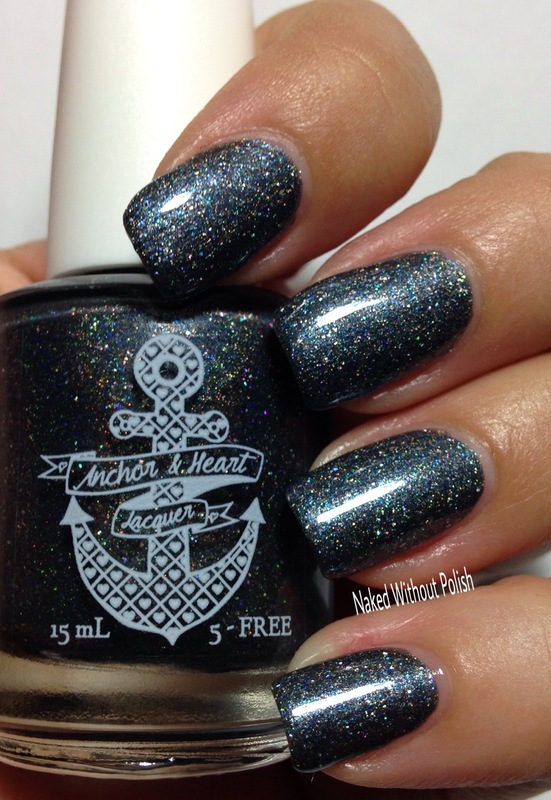 Make sure you are following Anchor & Heart Lacquer on all of their social media platforms (links below) to stay updated on news, releases, and sales. 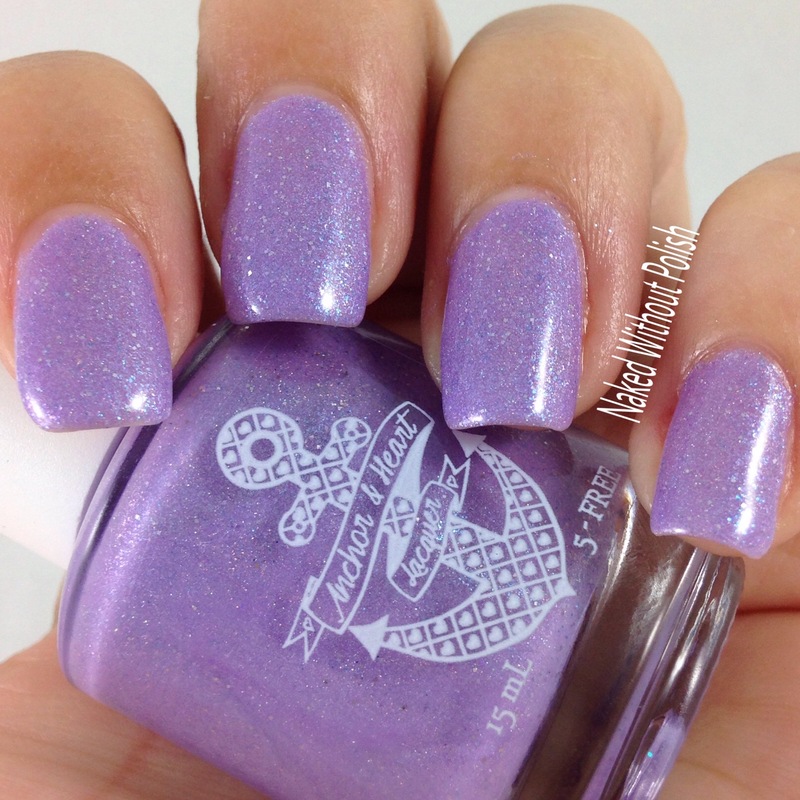 Have you grabbed any of her Message in a Bottle polishes yet? Do you have a favorite? What do you think of these three?